This easy moist banana cake recipe is just the thing for a healthy, simple snack after school, or to whip up when you're expecting friends over for coffee. There's nothing quite like a cake that your family loves and that can be whipped up in 15 minutes. I like this cake with banana as it does not use butter. As much as I love butter, the fact remains, it is saturated fat and is full of cholesterol. This cake is made with unsaturated vegetable oil. This recipe is from my No Fail Basic Butter Cake recipe with added mashed bananas. •	Fold in flour till the batter is smooth, then pour into a baking "tin". I only ever use silicone non-stick bake-ware. •	Take it out of the oven immediately and allow to stand for 10 minutes. 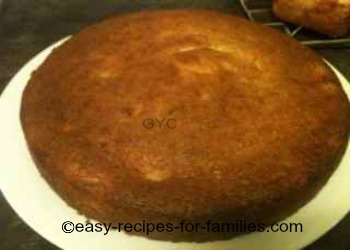 You'll find this to be a scrumptious cake providing you've used ripe bananas. It's ideal for lunch boxes. Now, wasn't that easy?...and it's preferable to cook a delicious cake rather than toss out an over ripe banana. I find using non-stick bakeware saves so much time. Only ever use very ripe bananas. They have a richer, fuller flavor and are easier to mash. Vanilla frosting would go very nicely with this cake, if you so choose. If this banana treat survives your family for more than a day, store it in an airtight container. Or discover hundreds of delicious yet simple recipes for great meals!